At 10 weeks I was sent to radiology because my uterus was big. 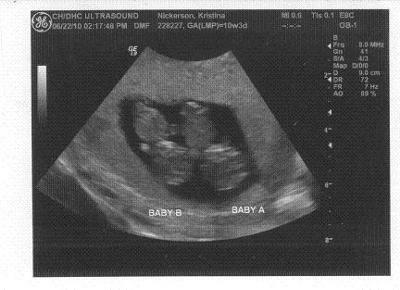 I laid down, the radiologist stuck the wand on my belly and I heard "hmmm there are two babies in here"
I was shocked, it never occured to me that I might have twins. But they're in a perfect position, in sync, and ready for the paparazzi! !